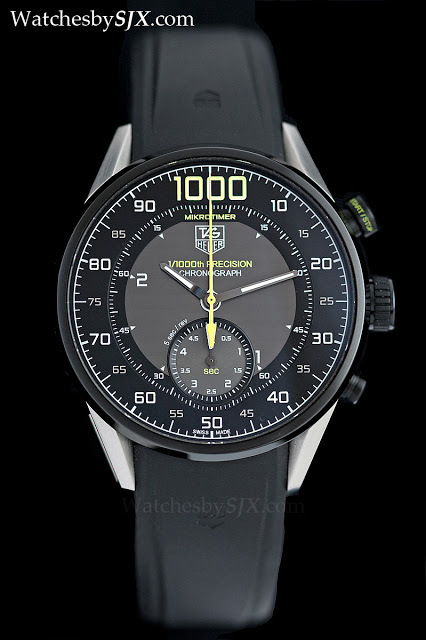 Much like how exotic car manufacturers shave off fractions of a second each year, TAG Heuer does the same for chronographs. 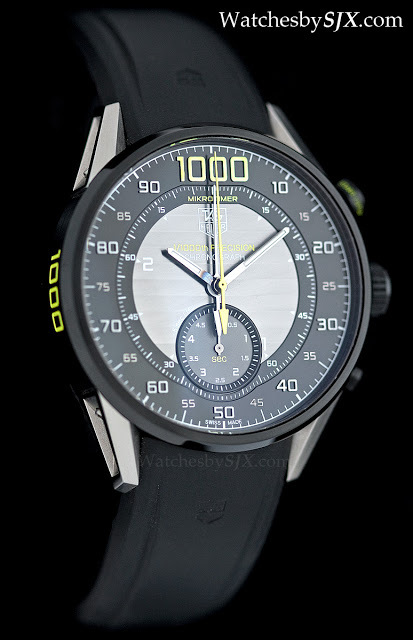 First unveiled in 2011, the Mikrotimer Flying 1000 was the first wristwatch to be able to measure 1/1000th of a second and in the same year it won the Best Sports Watch award at the Grand Prix d’Horlogerie de Genève. 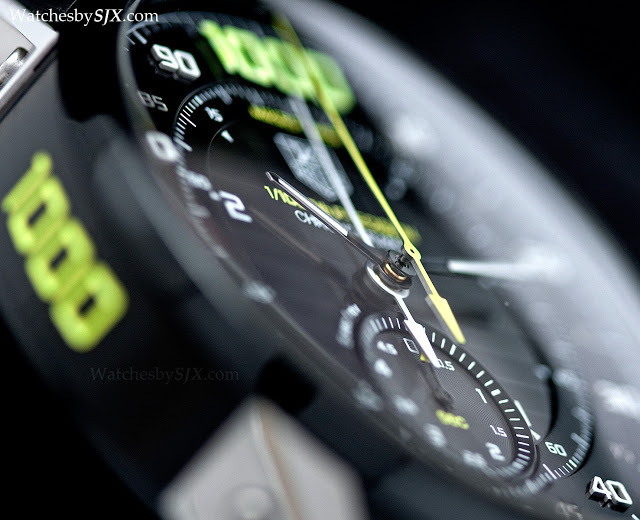 It was preceded by the Carrera 360 and Carrera Mikrograph, both of which could measure 1/100th of a second. 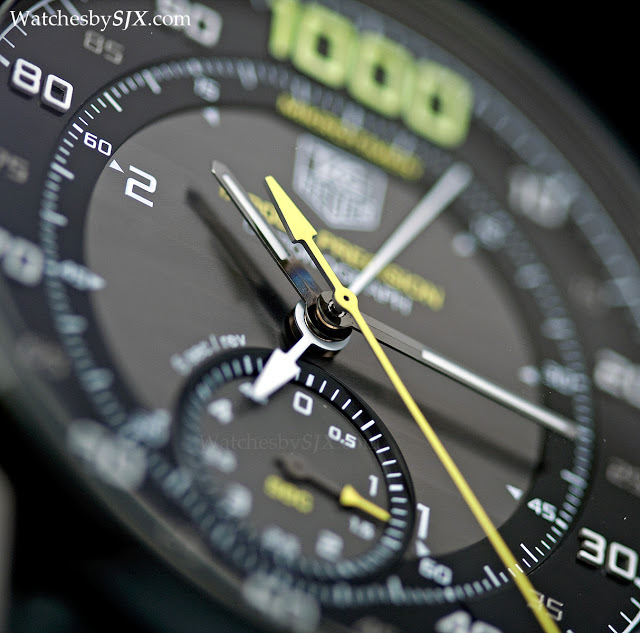 TAG Heuer has been the most successful amongst its peers (think Omega, Breitling, Rolex) in creating a niche for itself in advanced watchmaking. 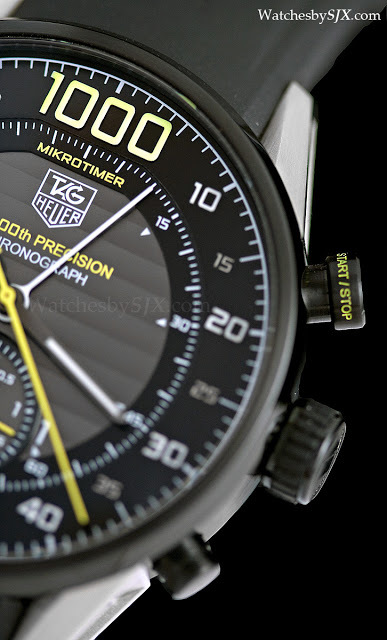 Its high horology efforts diverge into two distinct strands. 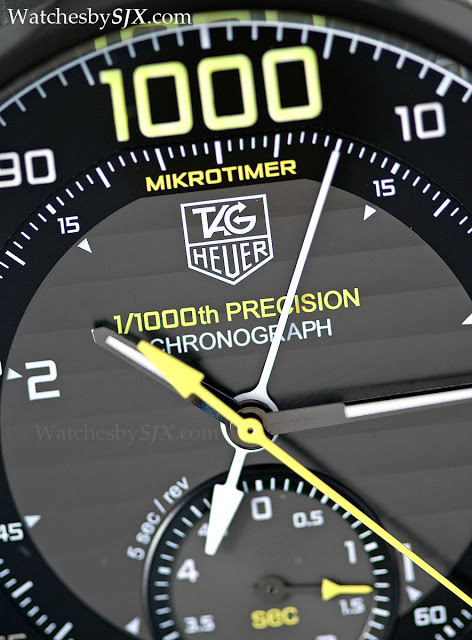 The first is high frequency chronographs, like the Mikrotimer Flying 1000 which measures up to 1/1000th of a second; an obvious nod to the brand’s history. 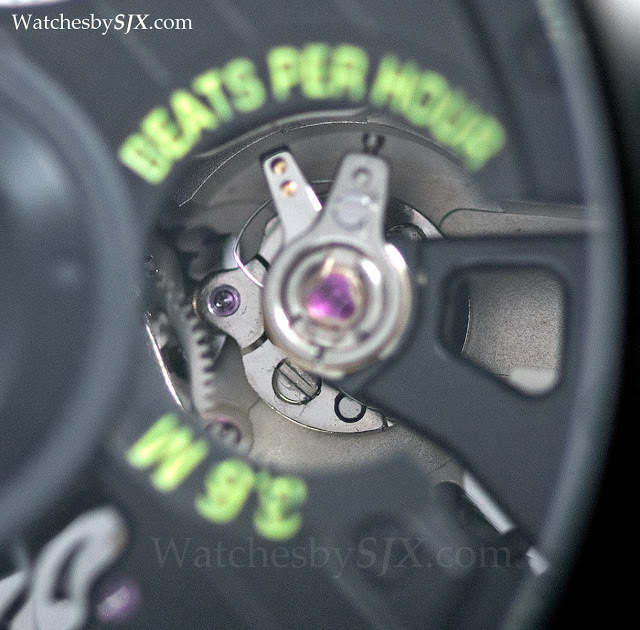 Alongside the stopwatches are the concept watches which rethink the three key mechanisms inside a movement – power transmission (belts in the Monaco V4), the regulator (the magnetic balance wheel in the Carrera Pendulum) and lastly the power source (in a yet to be announced timepiece). 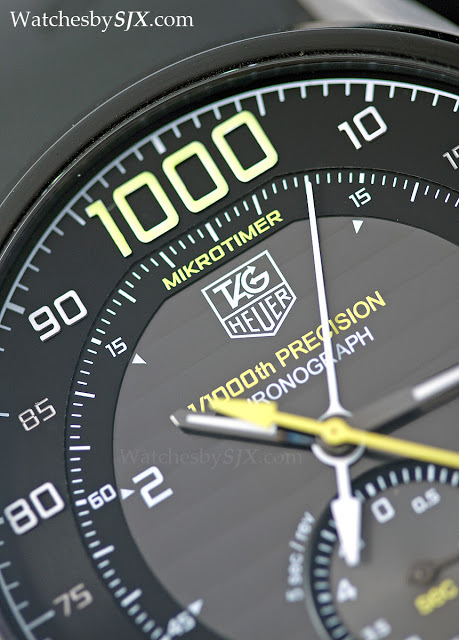 Each year at Baselworld when TAG Heuer unveils its latest concept watch, collectors and the industry tend to take notice. 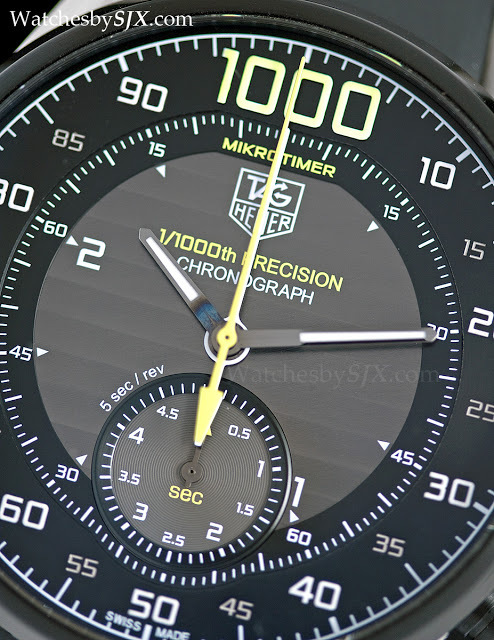 Like its two predecessors, the Mikrotimer Flying 1000 operates on the same basic idea: twin barrels, each with its own gear train, powering two separate escapements – one for the time and the other for the stopwatch. 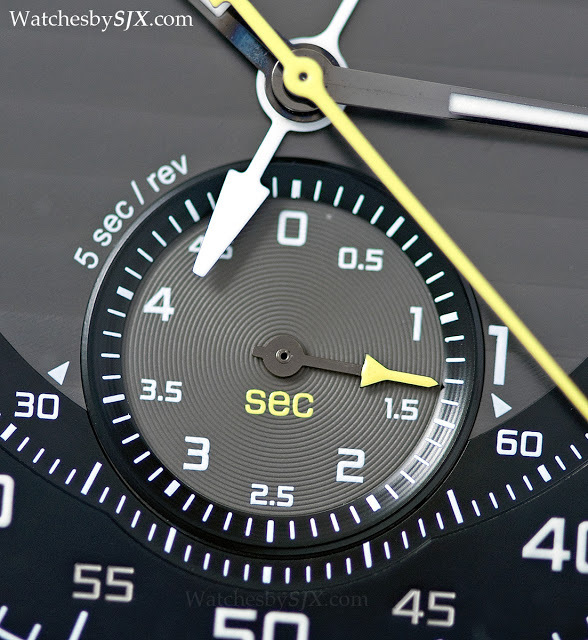 Beating at a conventional 28,800 bph is the escapement that regulates the time display, while the other chronograph balance wheel runs at 3.6 million bph, in order to achieve the 1/1000th second resolution. 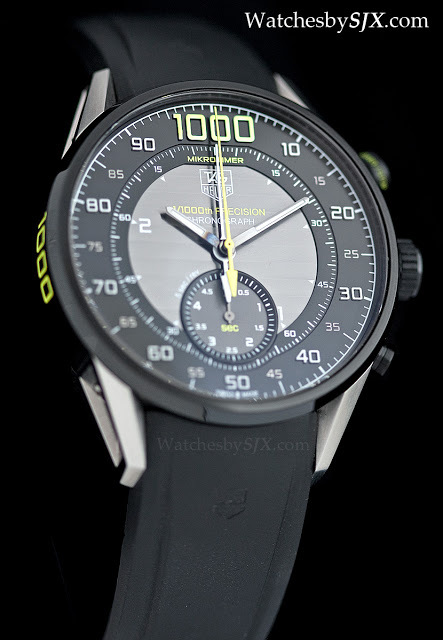 Because of the high frequency of the chronograph escapement, it has a power reserve of only 150 seconds, which is enough for one Formula One lap. That’s akin to the 1000 bhp Bugatti Veyron which will drain its 100 litre fuel tank in 12 minutes, at full speed. 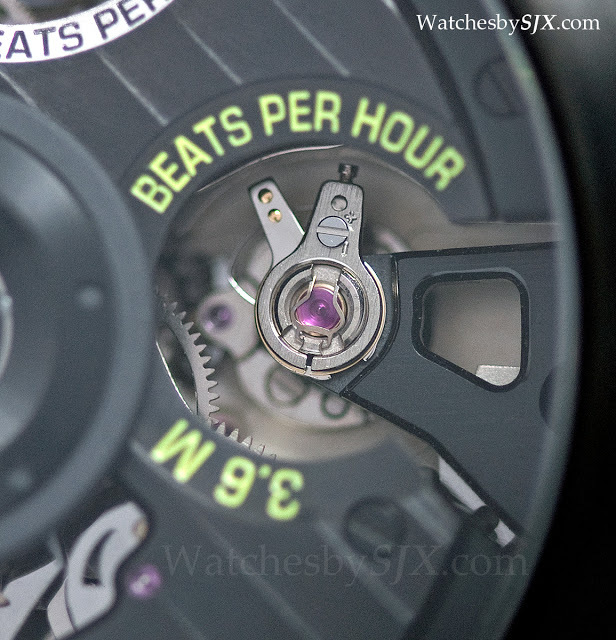 Fortunately the time display has a 42 hour power reserve. The 3.6 million bph frequency is achieved thanks to a hairspring in a special alloy with a small perforated aluminium wheel, which is linked to an pallet fork and escape wheel – TAG Heuer terms that the Launcher-Hub-Brake system. 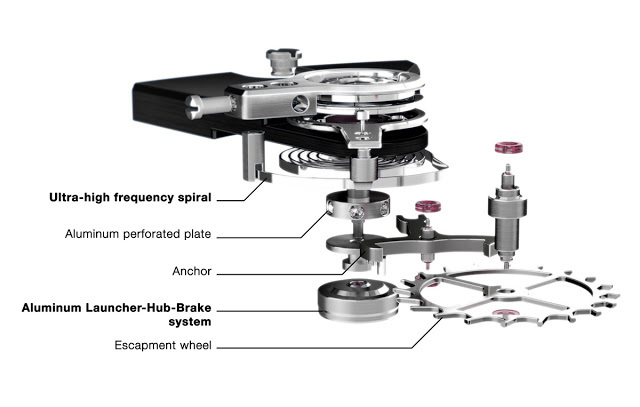 Though in principle both function the same way as in a conventional lever escapement, the escapement has been redesigned in order to function at its exceptionally high frequency. 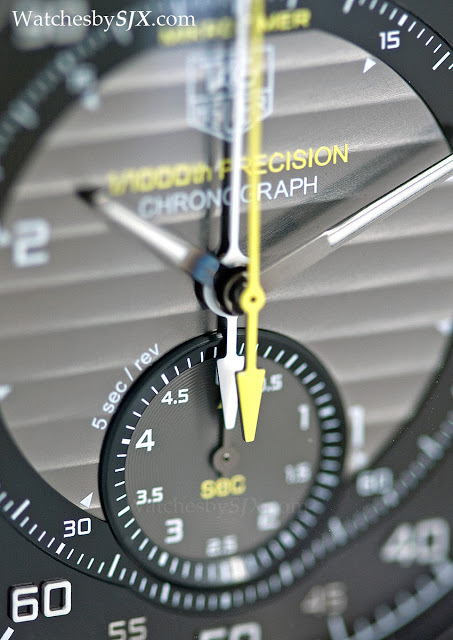 The 1/1000th of a second measurement is indicated by the yellow central seconds hand – which dashes round the dial ten times a second – while the white central seconds hand shows the seconds in five second increments. 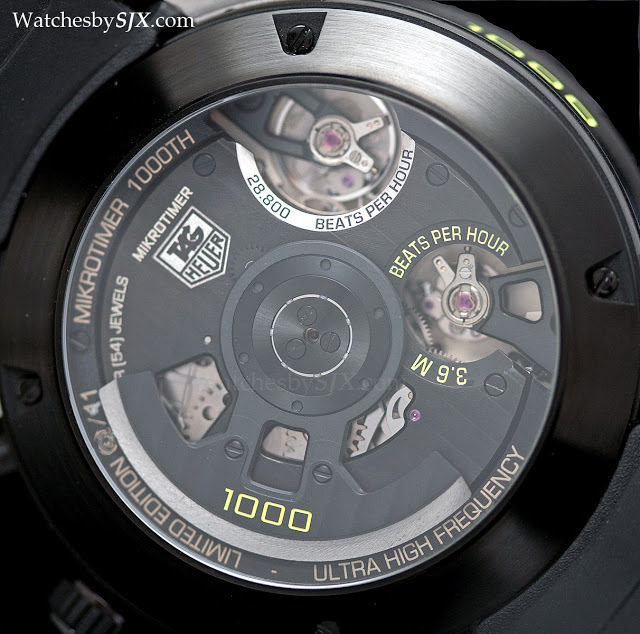 And then the sub-dial at six o’clock indicates the tenth of a seconds. 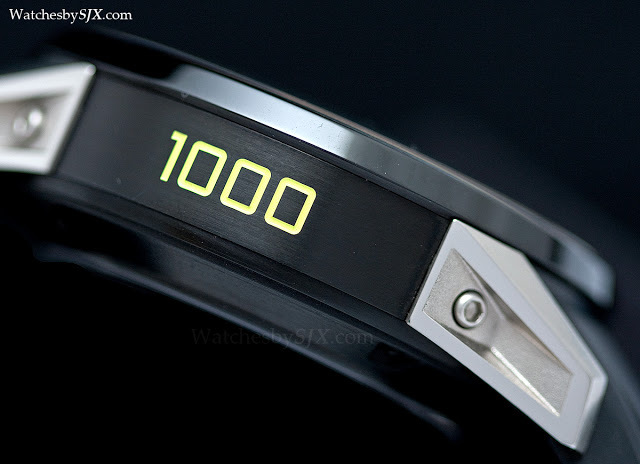 The 45 mm case is titanium carbide coated steel, with screwed on titanium lugs. 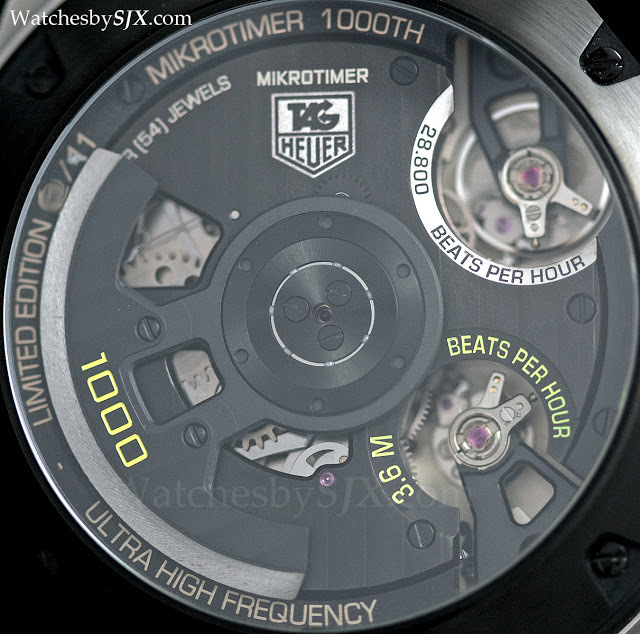 Only 11 pieces of the Mikrotimer Flying 1000 were made, with a retail price of US$120,000 or S$171,000. 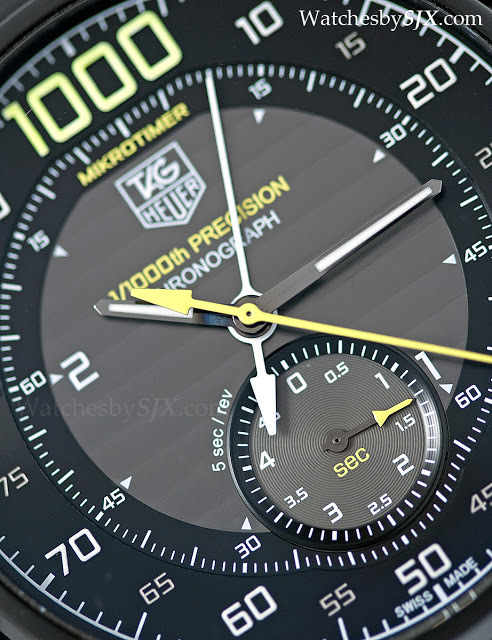 All of TAG Heuer’s high-end timepieces are far, far out of the usual price point for the brand. 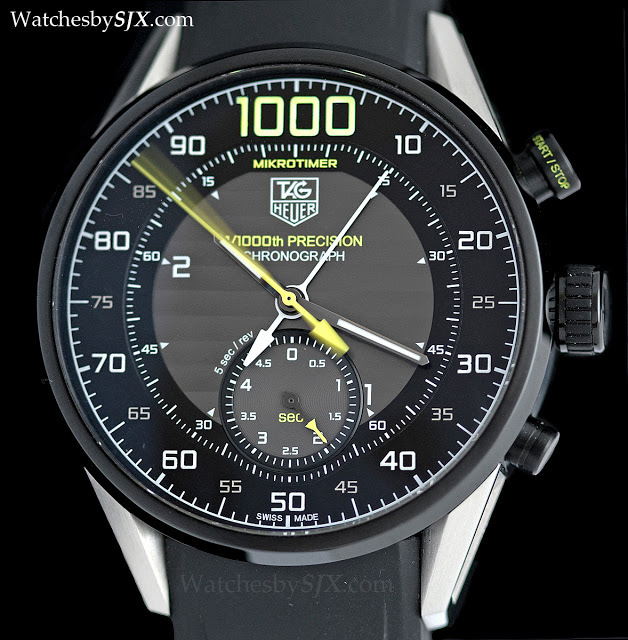 But they demonstrate ingenious engineering and have drastically reshaped the brand’s image from the nineties when its model line started with “2000” and ended with “6000”. This was largely thanks to Jean-Christophe Babin, who will soon depart for Bulgari. What happens next will be interesting. 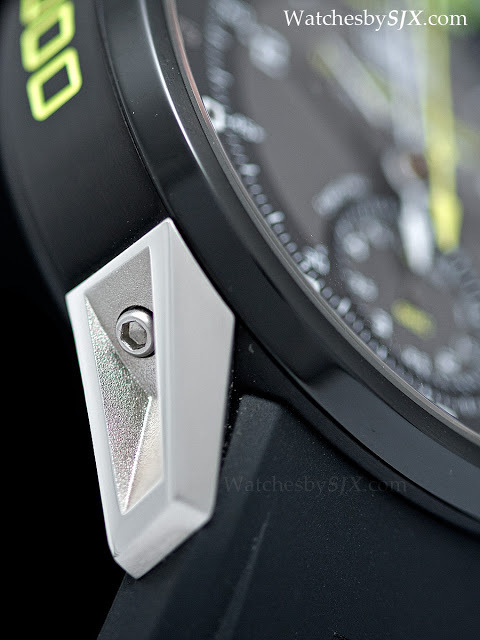 Click “Photo Essays” on the top bar to see more watch photography.